The living space opens to a covered 90 sf lanai. 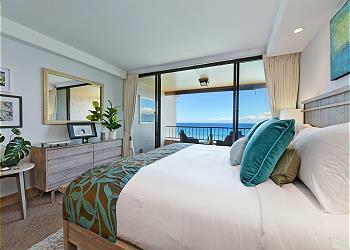 Wake up to the sweet tropical breeze & delightful sound of the lapping shoreline. The gentle silhouettes of Molokai and Lanai island will help entice you out of bed to enjoy your cup of Ka’anapali Coffee on your private lanai making this a premium location for whale watching. You will often see turtles in the crystal-clear water, and from December through April watch the whales from the lanai. Use the binoculars to get a close up, unobstructed look at the sea life. You will feel like you are floating on top of the world. Large beach towels, two Tommy Bahama beach chairs, a cooler are available for your use. The quiet surroundings and manicured tropical gardens at the Maui Kai at Kaanapali offer uncommon privacy, free parking, yet the activity of the Kaanapali Resort area is close by. Spend the day at the pool heated pool and Jacuzzi that has an adjoining cabana with brand-new kitchen and lending library for your convenience. Or choose to spend your day at the world famous Kaanapali beach. Close your evening by choosing to either dining in your home, BBQ, on property, or perhaps just making a reservation at Dukes!